I was born and raised in Alexandria, VA. I am the youngest of three boys. I played basketball for most of my life then slowly transitioned to ultimate my freshmen year of college. I currently attend the University of Mary Washington and play for Mother of George. 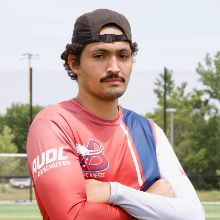 I played for the Breeze last year and can't wait to suit up again and compete with some of the best ultimate players in the country/world. Thank you to the Breeze Management for believing in my abilities. (I have two quick shoutouts if that's okay) Shout out to all of my teammates on MOG and my coaches, especially Keys Pattie. Huge shout out to all my friends and family for the constant love and support, especially my Mother, Brenda and my Father, Jeffrey.